Opening Wednesday March 1 at Pier 90, 7 pm to 10 pm. On view through March 5. Now is the time for art fairs aplenty, and Volta NY is just one of many. Volta stands out singularly (ha) because they focus on solo artist projects only. Though they’re all about solo stuff, by no means are they taking a minimalist route. At Pier 90 you can catch not only the water, but the work of artists from 38 nations shown by 96 galleries and art spaces across 5 continents and 36 cities. You needn’t be a math whiz to figure out that is a lot of art to place your eyes on. Only not literally, that could cause vision issues and probably a lot of side-eyeing. If you stop by on the first night, it’s free to enter, but any other day it’ll cost you $25. This is Volta’s tenth year of existence, so you can expect they’re pulling out all the stops this time. 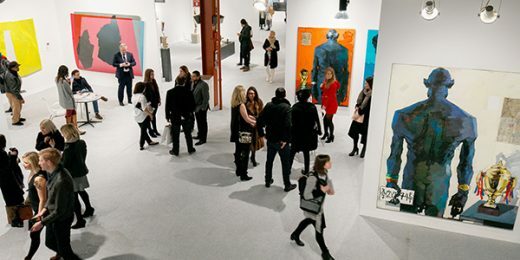 This week you can also catch The Armory Show (ticket bundles are available, which get you into Volta and Armory) and SPRING/BREAK, in a new location in Times Square. If you wish, you can pop around the piers all weekend for a veritable art adventure. The art doesn’t stop there: the Architectural Digest Design Show will be from March 16-19, also on the pier. And we can only wonder: will The Mars Volta be at Volta NY?